“You wanted to be photographed exactly like thousands of other people who pose on the bronze chair next to his bespectacled, behatted statue outside the Brasileira café. You were just being ironic, believing that becoming overly attached to Pessoa was a typically Portuguese disease.” —Teolinda Gersão, “The City of Ulysses,” 2011. In this dispatch from Literary Lisbon, we offer a quick summary of movements and themes in Portuguese literature, in the order in which a visitor might encounter them via the text of the city. The memory of Fernando Pessoa (1888–1935) dominates Lisbon and its literature today, but Lisbon’s literary history is complex and layered, and as the city opens up to you, you’ll discover remembrances to other writers everywhere you turn. The Book of Disquiet, this program’s namesake volume, is a unique and difficult creation that, like Lisbon itself, has been reinvented more than once. It is made up of fragments from scraps of paper found in a trunk after Pessoa died. It is unclear exactly how he intended to organize the book; its form, therefore, changes with each editor and each translator, depending on how he or she selects and arranges the fragments. On the surface, it is about an “assistant bookkeeper in the city of Lisbon” named Bernardo Soares, who works in the grid of streets in the center of the city known as the Baixa. The fragments have been numbered by the editors, so while the book appears ordered, it is an order imposed on it by others—as the grid was imposed on Lisbon in the 18th century. I can’t even want to be something. Apart from that, I have within me all the dreams of the world. A book of Pessoa’s poems has been called a “one-volume course in the soul of the twentieth century.” While you will stumble across statues, shrines, house museums, paintings, and even graffiti of Pessoa all over Lisbon, sometimes it seems like it is the humble tabacarias of Rossio Square that speak most directly of the poet’s soul. Pessoa was part of a group of modernist poets, the Orpheus Generation, named for the influential magazine Orpheu, which they founded in 1915. While short-lived, the movement and their magazine were ahead of their time and at the forefront of European modernism. While a small country, in some ways Portugal is bigger than it looks. 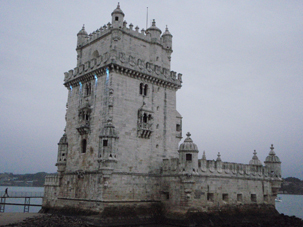 The Tower of Belém, one of the symbols of Portugal, is an architectural treasure right out of the Age of Exploration. It also contains clues to the outlook of Portuguese writers. A rhinoceros carving among the tower’s decorations is said to have been Europe’s first representation of the animal in art. Because the Portuguese began sailing to Africa and then to much of the rest of the world so early, they were seeing and reporting back on parts of the world that most other Europeans had yet to visit. And that world was viewing them as well—the Portuguese are depicted in African carvings, in Indian drawings, and in Japanese silkscreen panels. And so that fortress and guardpost, so near to the site from which the ships launched into the discoveries, is at once a closed world unto itself, sealed tight and defended, and a secret portal to elsewhere. I will be content to breathe my last. The very first to cultivate this land. Portuguese culture today reflects the influences of centuries of exploration, trade, colonialism, intermarriage, slavery, revolt, and war. Its literature is multiplied by the literatures coming out of the country’s island territories and former colonies, without which Portuguese literature cannot be fully understood. Among the many Portuguese and Lusophone writers whose experiences or ancestry beyond continental Portugal have shaped their work are Teolinda Gersão, José Eduardo Agualusa, Ruy Cinatti, Mia Couto, Djaimilia Pereira de Almeida, and António Lobo Antunes. Antunes (1942–) was forced to serve as a doctor with the Portuguese Army in Angola during the country’s war for independence (1961–74), which, in a rough parallel, might be considered Portugal’s Vietnam War. It’s said that recent Portuguese fiction, with its newfound emphasis on this experience, appeals to Americans in particular for this reason. Antunes has a phantasmagorical and yet grounded vision. Here is the beginning of a long riff on an imagined underwater Lisbon from The Natural Order of Things (1992, trans. by Richard Zenith): “Lisbon, my friend, is a submerged city, the water closes over our heads, the clouds are just floating masses of seaweed, the mannequins of tailor shops are mermaids without heads.” While some imply that the strain of magical realism found in much contemporary Portuguese literature is a transplant, there is also a convincing argument that it emerged organically from Lusophone cultures, with one example being the magic traditions native to some isolated villages in Madeira. There is also an important and often daring strain of Portuguese literature from the Azores Islands (900 miles off the continent). The islands have produced many writers and intellectuals, often with a quite different take on the world. These include the late 19th-century poet Antero de Quental, the prolific author and member of parliament Natália Correia, and the contemporary novelist João de Melo, whose work is searing and often livid, painting a wild and haunting vision of the lives of the Azoreans before the islands’ modern development. There is much more to explore: Brazil’s contributions to Lusophone literature are immense and too numerous to list here. There are also Cape Verdean, Goan Portuguese, and Mozambican literatures with relevance to Portugal, among others. “The day was already hot, with a dark-blue sky and one of those shining festival suns that inflame the stones in the street, gild the dull dust in the air, throw mirror-like sparkles on to windows and give to all the city that white, chalk-like glitter, monotonously alive and implacable, that tires and somewhat saddens the soul in the slow summer hours.” —Eça de Queirós, “The Maias,” 1888, trans. by Patricia Pinheíro and Ann Stevens. One of the current “mysteries of Lisbon” that many visitors notice is the large number of lovely but crumbling buildings. Rest assured that many of these are in stages of restoration, a few halted by the financial crisis. Some extreme cases are the result of past difficulties with rent control laws, rather than a lack of concern for preservation. Because of this atmosphere, some might find Lisbon’s elegance faded, but others might appreciate its relative lack of chain stores and the survival of many traditional shops in the downtown (also due to commercial district rent control). These include custom shoe, hat, and glove makers ready to outfit the visitor in versions of the same finery favored by Lisbon elites at the turn of the 19th century. In large part, Portuguese literature has been a literature of the elite until recently. For much of the country’s history, literacy was not widespread, a trend that worsened in the 20th century under the fascist dictatorship of António Salazar after a brief period of hope after 1900. Around that year, the overall literacy rate was 20 percent, and only seven percent for women. One of Portugal’s greatest 19th-century writers, Eça de Queirós (1845–1900), skewers Lisbon’s upper classes in his novels. His way had been paved by Romantic Movement writers who had already been attempting to inject a more colloquial approach into Portuguese literature earlier in the century, in reaction to a long tradition that had been largely defined by a division between high and low culture since the Renaissance. The Maias, said to be Queirós’ masterpiece, showcases his favored themes of unknown parentage, abandonment, decay, and idleness. Frequent comparisons to Dickens are apt, but he can be even edgier, sharper, and funnier. 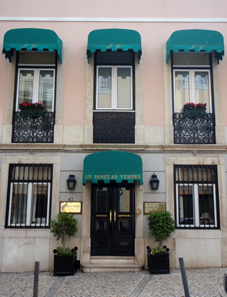 The house at the center of the story of The Maias, known as the House of the Green Windows (Casa das Janelas Verdes) can be seen just a few doors down from the Museu Nacional de Arte Antiga, and is now a boutique hotel. Eça’s world can also still be experienced inside the Grémio Literário (Lisbon’s private literary club and the site of DISQUIET participant readings). His characters flit in and out of the Grémio for games and drinking, to the opera, and to the resort town of Sintra for weekend trysts. After 1900 and the early modernists, another movement arose. The mid-century Generation Presença, named for an influential journal of the same name, was responsible for a revival of Pessoa, who had begun to be forgotten as soon as the 1940s. The mid-century era was also dominated by the social realist style of writers like Miguel Torga (1907–95). Meanwhile, in the rural Algarve and Alentejo (Portugal’s poorest region), a wave of writers were born in the 1950s through 1970s who would emerge after the 1974 Carnation Revolution. The Post-Revolution Generation now includes such writers as the groundbreaking novelist Lídia Jorge from the Algarve, and José Luis Peixoto, who writes of the lives of rural people in the Alentejo’s struggling farming villages. Susana Moreira Marques‘ Now and at the Hour of Our Death is an unusual work of creative nonfiction about the struggling northeastern region Trás-os-Montes. Novelists from the current generation include valter hugo mãe, João Tordo, Jacinto Lucas Pires, Gonçalo M. Tavares, and Patrícia Reis. 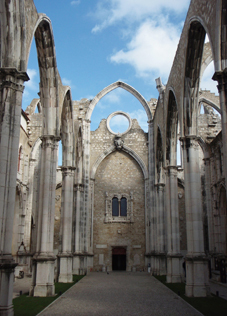 The Convento do Carmo in the center of Lisbon is an icon of the city’s history. This church was mostly destroyed by Lisbon’s great earthquake on the morning of November 1, 1755, while it was packed with parishioners. The roof caved in and was never rebuilt out of respect for the victims, leaving an open-air space and lawn beneath a few soaring arches. The surviving parts of the structure and the vacant space speak to two contrasting themes in writing about Lisbon: the pursuit of a presence, and the experience of absence. As old as Lisbon may feel to anyone lost in the winding alleyways of Alfama, the truth is that much of the ancient city is missing. Outside of Alfama and Belém, which were both spared by the earthquake, a large majority of what you see dates only to the 18th century reconstruction of the city. One of the most important poems about Lisbon, Sophia de Mello Breyner Andresen‘s (1919–2004) “Lisbon,” speaks to this sense of absence. The poet became so beloved during her lifetime that she became known to the Portuguese simply as “Sophia.” Her poem became so beloved of Lisbon that it is found at two points overlooking the city, on a plaque sited on the wall of a scenic overlook (miradouro), and in three languages on three stone benches on the grounds of the Castello São Jorge that dominates the entire city. Nobel Prize–winner José Saramago‘s (1922–2010) The Year of the Death of Ricardo Reis is the most famous novel about “a presence” in Lisbon, but it is not the only one. Antonio Tabucchi‘s Requiem: A Hallucination, coincidentally developed by the Italian-born author around the same time Saramago was writing his novel about an undead Pessoa heteronym, features a quest for Pessoa’s ghost around Lisbon. A third novel, perhaps inspired by these two, perhaps not, is John Berger’s Here Is Where We Meet, which while written by an Englishman, offers a vision of the city worth noting within the context of Portuguese literature. In it, the narrator (who may or may not be Berger himself) chases glimpses of another ghost, that of his own mother, as she draws him across Lisbon and to the famous aqueduct bridge. Wim Wenders’ 1994 film Lisbon Story is yet another international example of a Lisbon odyssey in search of an elusive figure. One of the curious things about the theme of presences and absences is that they appear to be at least partially a gendered response to Lisbon. Male writers may tend to sense a presence, while female writers, as they have throughout the long tradition of Portuguese literature, often speak of an absence. Portugal’s earliest literary texts were songs known as cantigas written in ancient or Galician Portuguese. Many were about missing a friend or absent lover, and were a female oral tradition co-opted by male scribes writing in the voices of women. In 1669, a set of letters that came to be known as Letters from a Portuguese Nun appeared. While their authorship is in doubt, and scholars tend to attribute them to a Frenchman as no Portuguese originals were ever located, they became a talisman for Portuguese women writers over time. They are in the voice of Mariana Alcoforado, a cloistered nun writing to her lover, a French chevalier who abandoned her and returned to his country. Contemporary women writers who have revisited the letters include the “Three Marias” (Maria Teresa Horta, Maria Isabel Barreno, and Maria Velho da Costa), with their New Portuguese Letters that challenged the dictatorship in 1972, and Portuguese-American novelist Katherine Vaz, in Mariana, a bestseller in Portugal. The Three Marias write of other absences as well, including those experienced by Lisbon women whose husbands were drafted in the colonial wars or who emigrated without them to Canada or the United States. The theme recurs in Teolinda Gersão’s writings on Lisbon as well. The relative “absence” of women writers from the Portuguese canon is not as complete as it might appear at first glance. Noblewomen had the means to write, such as the 18th-century Marquesa de Alorna, a direct ancestor of Maria Teresa Horta. Other early women writers include the 17th-century poet and playwright Bernarda de Lacerda and Maria da Felicidade Brown in the 19th century. The situation improved in the early 20th century with the appearance of the defiant poet Florbela Espanca and the poet and novelist Irene Lisboa. Later trailblazing female writers and poets have included Agustina Bessa Luís, Maria Gabriela Llansol, and Adília Lopes, who emerged in the 1980s. 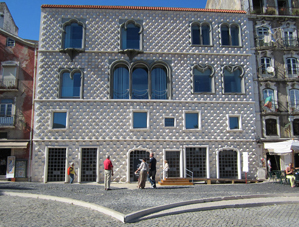 The José Saramago foundation is in a building known as the Casa dos Bicos. It was half destroyed in the earthquake of 1755, surviving as a shell with a partial façade. Today it is once again extraordinary, with an interior whose angles reflect the bicos, or points, of the façade and with staircases and mezzanines that give a paradoxical impression of welcoming openness and of a rather prickly labyrinth. Much of Lisbon has been through changes like this. The nearby Sé cathedral, the city’s oldest, was founded on the site of a mosque after the Moors were expelled from the city in 1147. In the ongoing archeological dig behind the cathedral, Arab village walls have been found above a lower layer of Roman ruins. Another nearby church stands on the site of what was once Lisbon’s largest synagogue before the Inquisition. Lisbon’s history is also a history of cycles of expulsion, a history of its exiles. A pronounced theme in Portuguese literature, especially in the 20th century, has been the rehabilitation of writers who have fallen out of favor or were never appreciated in their lifetimes. Perhaps the dictatorship and the revolution made this more starkly obvious in Portugal than it is elsewhere. Pessoa himself was a rediscovery who reemerged from obscurity through the hard work of scholars and translators like Richard Zenith. Even fado, a quasi-literary genre itself, fell out of favor because of its use by the dictatorship, and then returned, in part through the efforts of modern fadistas like Mariza, whose international success largely came before her widespread domestic appreciation. Saramago, who was from a humble background, began writing late, and his reputation was established only after the revolution. Women writers like Maria Teresa Horta of the Three Marias have reemerged after decades of being shunned for being outspoken feminists. As she put it in a 2013 interview, “they shut me up for years.” The late poet Alberto de Lacerda, to whom this program is dedicated, has fallen out of print despite having had many illustrious supporters in his lifetime. 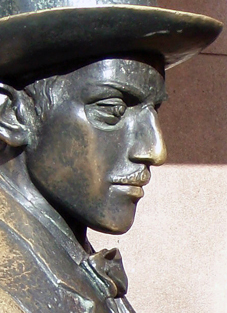 Once you spend a bit of time at the Café Brasileira, you’ll notice that directly across from the famous seated figure of Pessoa in bronze is a statue of António Chiado, a semi-forgotten poet, on a high pedestal. He lends his name to the entire neighborhood, but you can’t sit in Chaido’s lap, and he often goes unnoticed. In addition, the street on which the two writers face each other is the Rua Garrett—named for another lesser-known writer, the Romantic poet João Almeida Garrett. Juxtapositions of the celebrated and forgotten, of restoration and ruin, appear throughout Lisbon. The positive side of these harsh cycles is the potential thrill of rediscovery, of holding a book in your hand like an artifact dug from one of Lisbon’s layers and finding yourself wanting to tell everyone about it. Who will you discover in Lisbon? See also our Recommended Reading.